This month is the third of a six-part series on croning – a feminine rite-of-passage ritual for those reclaiming the power and wisdom of the old woman, the crone. It touches on some of the symbols of the crone you can consider incorporating into your ritual. This is often considered the gem of the crone because it is associated with spirituality and wisdom. Everyone who attended the weekend event at which I croned was given a small piece of amethyst and the instruction to give it to me with a personal message. 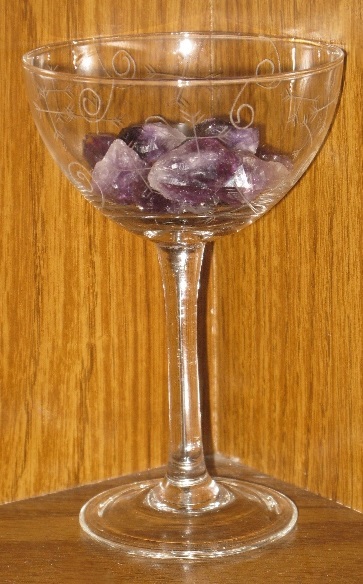 I was given an etched champagne glass to collect them in. Braid / stole / shawl: A wearable symbol of the level of crone is a stole or braid, that is placed over her shoulders. It can be round woven from ribbons representing the elements, or it can be of colors that have meaning for the crone. Charms, beads and crystals can also be added. I chose a black shawl as the garment I wished bestowed upon me because old women of all nationalities have worn shawls. Cauldron: This customary witch’s tool is associated with the crone goddesses Cerridwen, the Celtic Keeper of the Cauldron; Hecate, Greek Goddess of magic and the underworld; and Kali, the Indian Goddess of destruction and rebirth. It is a symbol of germination, transmutation and transformation. It is the merging of the Great Goddess and the Great Mother. Crones stir their wisdom in the cauldron. I used mine to hold wisdom scrolls (to be described next month). 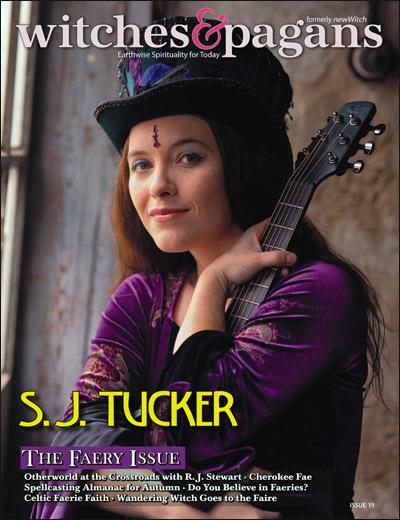 The placing of a crown on the head symbolizes rising to a higher rank – in this case, the rank of crone. 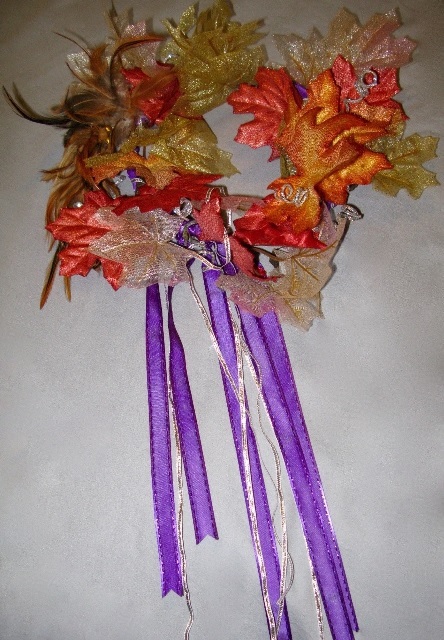 It can be made by the crone from dried flowers, branches or other materials that are available as well as meaningful. Mine was made for me by two dear crones. Owl: The owl – the bird of magic, darkness, prophecy and wisdom –is considered to be the totem of the crone. A staff is another symbol of initiation into cronehood. I chose to make a ceremonial one modeled after a medicine stick I had seen. The skull of a grandmother goat was a gift from a fire witch and farmer. Leather laces were strung through three holes to which I attached a variety of charms, amulets and other meaningful objects that previously had been on my altars or tucked in various places. It is both personal and powerful, and remains a work in progress. Staffs need not be elaborate. They can even be disguised as walking sticks. Waning moon: As the moon decreases in size going from full to new, it is known as the waning moon and is associated with the crone. It’s a time of intuition and divination. Next month I’ll prompt you to reflect on your life and the wisdom you have to share. My croning ritual will be a large part of the August column, along with some ideas for your own and some references. We’ll wrap up in September with any questions you may have as well as some details that did not fit into previous columns. Croning : Are you a Crone? This month begins the first of a six-part series on croning – a feminine a rite of passage ritual for those reclaiming the power and wisdom of the old woman, the crone. Crone is one of triple Goddesses, the third stage, the wise elder. Saturn return marks the time when the planet that rules lessons, responsibilities and limitations returns to the same point it was when you were born. The first time it happens is in your late 20s. It comes back around again in your late 50s (A good reason to have mid-life crises.) and then again in your late 80s. Each time, the entire influence lasts almost three years. Known as “the teaching planet,” Saturn comes to let you review your life and account for your choices. You may feel smacked down, put through the meat grinder and tested. During this time you may come face to face with all sorts of situations you probably would rather avoid. When my second return came, I found myself becoming very aware that I was aging and that ageism exists. Our society is obsessed with youth, often dismissing women as they mature. To crone was a way I found to celebrate those decades, and to raise awareness around the issues of aging while challenging the image of old hag. To me, it was an honor to accept the title of crone. A crone is no longer a mother raising children. She knows the value of time, and takes some to care for herself. Her creativity flowers. She is weathered and realistic, but she still dreams. She may be slower, but she’s steady. Those who only see she is becoming “old” miss the ripeness that comes with experiences and the wisdom gleaned from them. 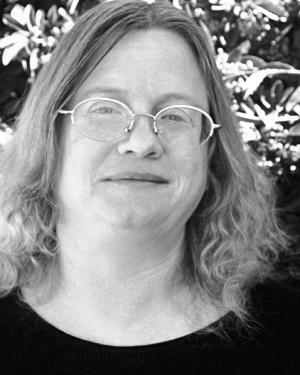 She may have a sense of empowerment and a willingness, even an urge, to pass along her knowledge. While society seems to place little value on her wisdom, I believe the world is in need of it. At this stage, a woman is moving into the greatest time of her life and a croning marks that. It celebrates older women, for they have always been the keepers of the mysteries. Nowhere else in my life was that milestone recognized or honored as it was among my magical family. I viewed my croning as my acceptance of my passage into elderhood. I embraced my life for getting me to where I am, and embraced myself for arriving. I first wanted to crone at Mabon in 2013. My second Saturn return had come; it was more than a decade since my last flow; I was a grandmother. To pull it together in time would have rushed the process, so I did not announce my intention. Little did I know the events, challenges, losses and changes that would occur beginning that very Mabon afternoon and continuing to pummel me for months. It was clear I still had work to do around the issues of surrender and trust. The more my spiritual self was tested, the higher it soared. Come that next year I knew I was ready; I felt deserving. I had a wonderful sense of having come into my own, of realizing I have a voice and I have power – and that I’m not afraid to use them. One of the items I placed on the altar during my ritual was a drawing of a woman with wild botanical hair and these words by an unknown author: “A wild young woman can be tamed by time and circumstance but a wild old woman is untamable by any force.” I was now a wild old woman and proud of it. If you found yourself nodding a few times as you read this, perhaps you, too, are a crone. If you would like to honor that with a ceremony, my columns in the coming months may help. Next we will begin to explore the ritual of croning: what, when, where and who to invite. In June we will talk about the symbols of the crone. July will prompt you to reflect on your life and the wisdom you have to share. My croning ritual will be a large part of the August column, along with some ideas for your own. We’ll wrap up in September with any questions you may have as well as some details that did not fit into previous columns. Last month I turned 46. That’s when people start saying things like “oops, you are on the wrong side of 40 now” or “50 is coming soon”. Often disguised as a joke, but every so often with a serious tone of voice. It was the same when I turned 40. To be honest I didn’t really care, on the contrary: I gave a big party to celebrate it and had a great time! If someone says ‘you are getting old’ I always reply with ‘I hope so!’ Of course getting older isn’t all fun and games, but I refuse to give in to the negative stereotype of ‘the older woman’. People (but especially women) are tricked into being afraid to grow older. ‘Old’ being the synonym of obsolete, outdated, ugly, or worse. Commercials and adverts are trying to make us hate our aging body and be ashamed of wrinkles and grey hair. I still embrace my inner child, but growing older brings a lot of good things too. My mother often sighed: “oooh, to be young again and know what I know now…” Understandable, but I wouldn’t want to go back to when I was younger. I had a wonderful time then and horrible times too, but together it made me into what I am now. Over time I’ve learned to accept myself with all my virtues and vices. Still a work in progress though, but that’s okay. I’m slowly shifting into a new phase, and I hope I’ll be a proud and dashing crone one day! The etymology is full of negative annotations: old, useless, carcass, carrion (the decaying flesh of dead animals), etc. 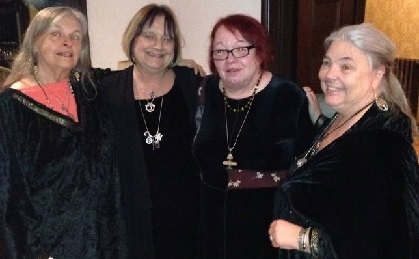 Not a nice picture at all… but a crone is (can be) more! In the pagan community the word ‘crone’ has a different meaning. The goddess and in her image a woman goes through three phases in order of age: maiden, mother, crone. 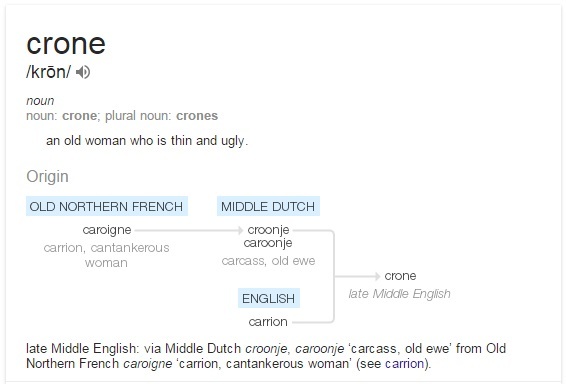 So yes, a crone is an old(er) woman, but not the useless, ugly person from the dictionary. Quite the opposite: a crone is a valued member of society, a wise woman who earns respect. She is a teacher and a mentor. Does this apply to women only? No, of course not. Although society seems to judge less about aging men than it condemns aging women, it’s no secret that nowadays men are also ‘targeted’ in the same way. More and more commercials, adverts, articles and the like are focusing on men. They too are encouraged to dye their grey hair, get a facelift, lose weight and look younger in any way possible. Of course there’s nothing wrong with taking care of yourself and your health and appearance, but there’s no need (or at least there shouldn’t be) to hide or be ashamed of getting older. Not for women, not for men. Both crone and sage are regarded as ‘pagan elders’. They have a lifetime of experience and most of them are very willing to share their knowledge. Personally I love to listen to people who have witnessed things I only know from history books. I try to listen to them, learn and pay attention. Not only in the pagan community, but also in everyday society. I feel we should value elderly people for what they are, give them the respect they deserve, hear their stories and pass them on. When we are honouring our ancestors, let’s not forget the living ones! eyes shining in the darkness. that she smiles upon in the night. I decided that as the seasons pass through, that I’ll cover each of the aspects of the Goddess. Instead of covering the Aspects as “Maiden, Mother, Crone” I’ll be covering them in the opposite direction. I believe that to understand the bringer of life, you should also understand the bringer of death, and vice versa; as the two are inextricably entwined with one another. With the end of October is the turning of the season into winter, the aspect of the Goddess for this time of year is the Crone. Goddesses: The Morrigan, Kali Ma, Nephthys, Tiamat, Hel, Hecate, Cerridwyn and many others. The Crone is the representation of death and rebirth, and often is feared because of the aspect of death. The cycle of life is birth, life, death, and rebirth. The Crone is the guide in the last phase of your cycle, she will walk with you as your cycle comes to a close, and guide your way, easing you through the transition. Often the Crone is the Goddess of the Underworld, or death. However, she is many other things as well. She is the Grandmother, the wise-woman who has experienced life. She understands, and has the wisdom of how to deal with the problems that arise in life. Celebrate the Crone, this is her time! She has much knowledge and wisdom to offer, and the patience to help you learn and grow! does not preclude or oppose science. Science is, after all, only the honest testing of ideas and the ability to observe clearly the confusing relationship of cause and effect. The best of science is deeply indebted to art. understands that science is left-brained and art is right-brained, and a whole brain includes both. Science, however, is not so easy with art. Science believes art is superstition. Science believes art is fuzzy, soft, not replicable, and therefore untrustworthy. (It is interesting to me that the Liberal s University I attended – UCLA – required students to take a variety of science courses, but the Science College I turned down – MIT – did not require students to study the arts.) Science defines itself as factual and art as fantastical. Truly great scientists understand the need to honor intuition along with information. But the world is rarely run by the truly great. So bit by bit, the art of healing is denigrated and the science of healing is venerated. The healer spends more and more time interacting with machines and drugs and technology, and less and less time with the patient; more and more time studying books and less and less time learning about the strange, symbolic, provocative powers of the psyche. The healer focuses more and more on fixing the sick individual and less and less on the patient’s need for wholeness in self, family, and community. Is this what I want? Is this what drew me to herbs? Is this what fascinates me about herbal medicine? My answer to all these questions is absolutely NOT. While acknowledging the usefulness of science, I maintain the right-brain’s superior abilities in the art of healing. I defend the rights of the miracle-workers, the shamans, the witch doctors, the old-wife herbalists, the wise women, those who have the skill, the personal power, and the courage to midwife the changes – large and small, from birth to death and in between – in the lives of those around them. medicine. Magical plants. Psycho-active plants. There is a thread here, and it goes a long way back. At least 40,000 years. The plants say they spoke with us all until recently. Forty thousand years ago we know our ancestors were genetically manipulating, hybridizing, and crossbreeding specific psychedelic plants. And using them in healing. Maria Sabina, one of the 20th Century’s most renowned shamanic healers, went into the forest as a small child and ate psilocybin mushrooms because they spoke to her. She healed only with the aid of the “little people” (mushrooms) and she healed not just body but soul. In the Amazon, the students of herbalism, of healing, are apprenticed to psychoactive plants as well as to human teachers. There is a lot of talk lately about the active ingredients in plants. I’ve had many a chuckle as product ads claim to have the most of this or that only to be superseded by the announcement that a new, better, more active, active ingredient has been found. For example, when Kyolic Garlic was shown by Consumer Reports to have virtually no allicin (the “active” ingredient), Kyolic countered with an ad campaign claiming superiority because it contained a different, stronger, active ingredient. For instance, most standardized St. John’s/Joan’s Wort tinctures are standardized for hypericin. But the latest research shows that hyperforin is the real active ingredient! To illustrate: an article several years ago in JAMA on use of Ginkgo biloba to counter dementia explained that no active ingredient from among the several hundred constituents present had been determined and it was, in fact, likely that the effect resulted from a complex, synergistic interplay of the parts. An article in the New York Times, however, cautioned readers not to use ginkgo until an active ingredient had been established. This story doesn’t have an ending, for it is ongoing. The dance of health and illness, of art and science (and don’t forget commerce) has no pause. So the ending of our tale is not happy, but neither is it sad. Take a look; the real ending of the rainbow is in your own heart.